Ideally situated with Cua Dai Beach on one side and the De Vong River on the other, Hoi An Beach resort is truly the best of both worlds. The resort’s 121 rooms are spread out in clusters of low-lying buildings, designed to resemble a Vietnamese riverside village amidst immaculately landscaped gardens. Life as it plays out on the river is nature’s very own television. From your river view balcony, watch ducks and small rowboats go silently by, fishermen casting their circular nets as they have done for centuries. Or go out on one of the resort’s kayaks (with or without a guide) and explore the peaceful river yourself, with a fishing rod as company. In the evenings, colorful floating lanterns are released on the river, recreating the magic of Old Hoi An. Hoi An Beach Resort is all about comfortable elegance. Rooms are generously sized with garden, river or sea views. Wake up to local specialties like banh nam, steamed rice flour rolls stuffed with shrimp, and international favorites at the included breakfast buffet, taken on the Cua Dai Restaurant’s waterfront balcony. Or indulge yourself with a traditional Vietnamese or Balinese massage, one of the many treatments on offer at the Waterlily Spa, the perfect complement to a day spent lazing around the resort’s two pools, one a drool-worthy infinity pool with sweeping views of the De Vong River. For the active traveler, the resort organizes complimentary tai chi sessions on its own private beach. A games room, mini-library and fitness center ensure there’ll always be something to do. Or take one of the resort’s many complimentary shuttle buses on the short 4km trip to Hoi An Ancient Town for some shopping and sightseeing or to see the Old Quarter lit up by colorful lanterns. A host of day trips can also be organized, including a visit to the spectacular Cham towers of My Son. Available now to the end of the year, the Discovery Package features two nights in a Garden View Deluxe room including buffet breakfast, a candlelit set dinner for two, one-way transfer to/from Da Nang International Airport, a 30-minute Oriental Foot massage for two, a half-day private tour to my Son including lunch, and much more for just VND3.6m++ per person. Spa lovers may opt for the Vietnamese Therapy Experience: two nights in a garden View Deluxe room including buffet breakfast, welcome fruit basket and 60-minute Vietnamese Traditional massage for two at the Waterlily Spa for just VND2.42m++ per person. 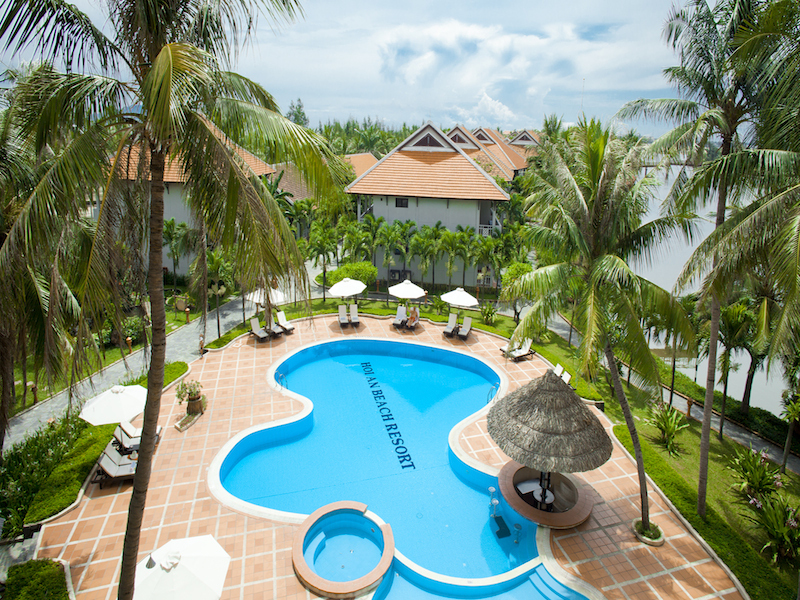 For more, visit www.hoianbeachresort.com.vn or phone (+84) 510 392 7011.